The final dome structure has been completed in 2018 at the United Arab Emirates' four-unit Barakah nuclear power plant, a key milestone for the giant project of 5,600 MW. In December 2009, Emirates Nuclear Energy Corporation (ENEC) awarded a coalition led by Korea Electric Power Corporation (KEPCO) a $20 billion bid to build the first nuclear power plant in the UAE. Barakah was chosen as the site to build four nuclear reactors successively, with the first scheduled to start supplying electricity in 2017. Construction of the first reactor begun in 2012. While currently complete, operation of the reactor has been delayed to 2019/ 2020 to complete operator training up to international standards. Uranium concentrates will be supplied by the four major nuclear energy and mining companies (Areva, Rio Tinto, Uranium One, Tenex), potentially driving uranium exploration and mining in the region. Waste disposal options include "regional cooperation", which, due to repressive political atmosphere and opacity, coupled with UAE financial resources, risk externalising nuclear waste management and environmental impacts to other countries. Furthermore, due to UAE involvement in the military campaign in Yemen, there is an increased security risk to the nuclear plants due to possible military attacks. Indeed, in 2017, Houthi rebels claimed to have targeted the Barakah plant with missile. A claim that was denied by the UAE. Project Details A giant project with four nuclear reactors, each with a gross output of 1400 MWe, in total 5,600 MWe. In May 26, 2018, Reuters reported from Dubai that the start-up of the Arab world’s first nuclear reactor - in the United Arab Emirates - was delayed and should start operations between the end of 2019 and early 2020, the plant’s operator said on Saturday. Nawah Energy Company, the operator of the Barakah Nuclear Energy Plant in the Al-Dhafra Region of Abu Dhabi, said it “has completed a comprehensive operational readiness review” for an updated start-up schedule for the reactor. Company Names or State Enterprises Emirates Nuclear Energy Corporation ((ENEC)) from United Arab Emirates - It is the organisation constructing the nuclear reactors in Barakah in cooperation with foreign investors and companies. Korea Electric Power Corporation (KEPCO) from Republic of Korea - KEPCO leads the coalition that, in 2009, won the bid to constuct the first nuclear power plants in UAE. Areva (Areva) from France - Areva is one of the four companies awarded contracts to supply uranium concentrate to the UAE nuclear power plants. Rio Tinto (Rio Tinto ) from Australia - Rio Tinto is one of the four companies awarded contracts to supply uranium concentrate to the UAE nuclear power plants. Uranium One Inc. from Canada - Uranium One is one of the four companies awarded contracts to supply uranium concentrate to the UAE nuclear power plants. Techsnabexport (Tenex) from Russian Federation - Tenex is one of the four companies awarded contracts to supply uranium concentrate to the UAE nuclear power plants. 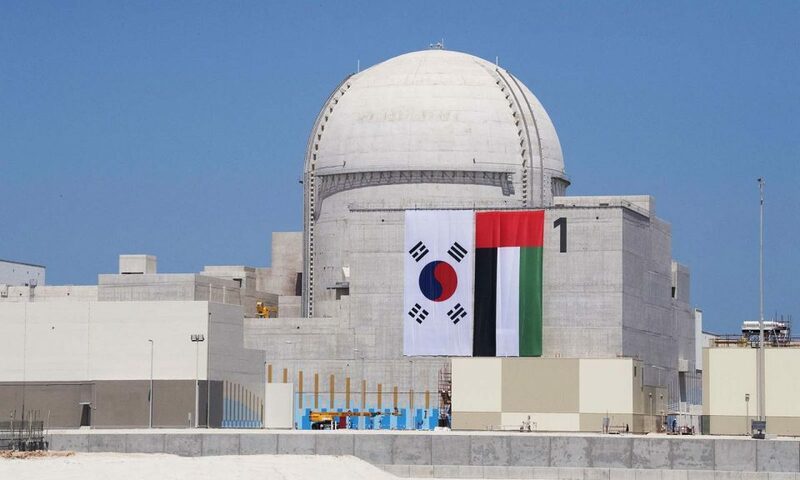 Other Regarding military use of nuclear power, it is emphasized from many sources that "The Barakah nuclear power plant will play an important role for the UAE's economic development and will be a role model for the other Arab countries, proving that nuclear power can be used for peaceful purposes" - said a South Korean diplomat in the UAE, requesting anonymity.. "We don't think the nuclear power plant will cause any problems in the region," he added. Officials in the UAE say their programme will not add fuel to fire in the region. .
Why? Explain briefly. No apparent opposition to a very large increase in production of nuclear power in the UAE and in the region. Muhammad Almajid. Course work, Stanford, 2016. 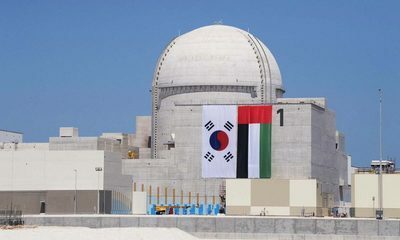 "The United Arab Emirates (UAE or Emirates) chose a Korean-led consortium to build four 1,400-megawatt nuclear power plants for the Emirates Nuclear Energy Cooperation (ENEC) in December of 2009. Currently, the UAE is ranked the 6th largest crude oil producer in the world and has the 7th largest natural gas proved reserves. Why would a country with such energy resources make such an expensive deal for a type of energy that it doesn't have the fuel for? Emirates does not have a major reserve of Uranium. This report summarizes why Emirates initiated its nuclear energy program as well as sheds light on the progress and the impact this endeavor left on the country up to this point". Other Comments Israel Defense. http://www.israeldefense.co.il/en/node/33675, by Dr. Shaul Shay | 1/04/2018 (excerpts). 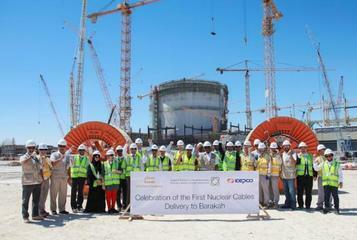 UAE's First Nuclear Reactor Completed. The United Arab Emirates announced that one of the four nuclear reactors at the Barakah power plant had been completed. The second reactor is 92 percent complete, the third 81 percent while 66 percent of the fourth has been completed, WAM news agency reported. When fully operational, the four reactors will produce 5,600 megawatts of electricity, supplying around 25 percent of the country's needs, according to the UAE energy ministry. The announcement came after visiting South Korean President Moon Jae-in and Abu Dhabi Crown Prince Mohammed bin Zayed toured the Barakah plant. The UAE is building a nuclear industry from scratch, hiring nuclear physicists, setting up a regulator, training operators and establishing institutes for radiation monitoring and accident prevention. According to the UAE’s Ambassador and Permanent Representative to the International Atomic Energy Agency (IAEA), Hamad al-Kaabi, the UAE has been continuously providing assistance to regional countries interested in launching nuclear programs. "When the UAE developed its approach for nuclear power it looked for a responsible approach with a commitment to the highest standards of nuclear safety and nonproliferation, part of it was to share that information with other countries who are interested in nuclear power," al-Kaabi said. The UAE has committed not to enrich uranium itself and not to reprocess spent fuel."